PMF allows you to apply predictive analysis to your measures. You can design a view that shows historical metrics and predicts future results, using a wide range of patterns and sampling frequencies. PMF analyzes data using all available forecasting models, finds the one that best predicted past performance, and applies it to predict future performance. Results are displayed in a side-by-side view that shows the patterns of change for the metrics. You can use these results as the basis for planning, or to demonstrate how an existing business strategy is most likely to succeed or fail. To fully utilize the predictive analysis functionality of PMF, you should configure predictive processing for specific measures to make forecasting results available in related views and reports. When configuring predictive methods, a map of all available prediction methods and sampling frequencies is presented for you to determine which ones provide the best results. You can easily select and change the method and sampling frequency used for predictive analysis without having any forecasting or advanced mathematics knowledge. Configuring predictive processing is performed by authors and administrators from the Edit Measure Metadata panel. For more information, see How to Configure Predictive Data. The following topics describe and show details of the views that use predictive analysis and forecasting to extend trends into the future. These views are available as drill-down options. Note: To enable users to distinguish between standard and predictive actual and target data displayed in some views and reports, cells containing predictive data have a different background color. When you click a Measure drill-down hyperlink, for example, Margins, and select Graph: Performance Trend (Predictive), the drill down takes you to the Performance Trend view, as shown in the following image. The Performance Trend predictive view shows the performance achievement for both past and future time periods, displaying graphic performance indicators side-by-side to visually show patterns of change in the metrics. There are no additional drill downs available from this view. When you click a Measure drill-down hyperlink, for example, Sales, and select Graph: % Reached Histogram (Predictive), the drill down takes you to the Performance Trend predictive histogram view. The method (algorithm) used to create the predictive data in the view varies. PMF analyzes all available methods, identifies the one that best predicted past achievement, and uses it to predict future achievement. 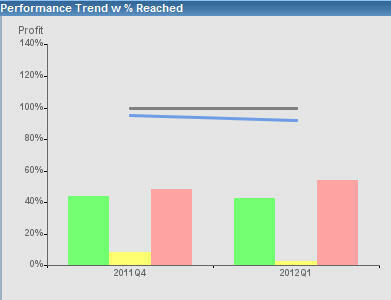 The following is an example of a Performance Trend predictive histogram view, in which the method used is moving average. 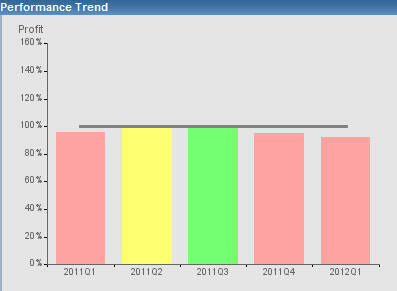 The preceding Performance Trend predictive histogram view shows the high, mid, and low moving averages for each time period, displayed in three separate colors, as indicated in the legend.